One morning this week I arrived early at the Sheraton Kampala Hotel and decided to walk through the lower gate opposite Speke Hotel, just to test their system. A pleasant faced askari readily unlocked the gate, checked my bag and let me through with a little banter and I wished him a nice day – but only verbally where he probably hoped for more. I climbed up the staircase with that early morning vim and vigour of a man addressing a mountain trusting in the presence of a large prize at the top – in this case, my first fruitful meeting of the day punctuated by a good hotel breakfast. A few metres into the climb I stopped, breathless; not because of what you would suspect if you saw my numbers on a weighing scale, but because of the sight that caught my eyes just then. I have taken more to gardening these days for a number of reasons, and last year had a very disappointing experience with a packet of marigolds that sprouted massive stalks that bore absolutely no flowers. Here, in that Sheraton strip, I saw a bunch of healthy marigolds and wistfully touched one for a few seconds when I realised what was before me and that’s when my breath caught in my throat. I was a little confused yet felt a tingle of excitement; some time in December I stayed over at a vineyard in South Africa where they had a spice garden that looked exactly like this! And I spent a couple of evenings there breathing in the air and inspiration to work harder at my own. And now here I found that my own Sheraton Kampala had implemented the very same! On closer inspection, I noticed that some of the spices and vegetables had been snipped the way my own at home are because I frequently pick bits for use in the kitchen. 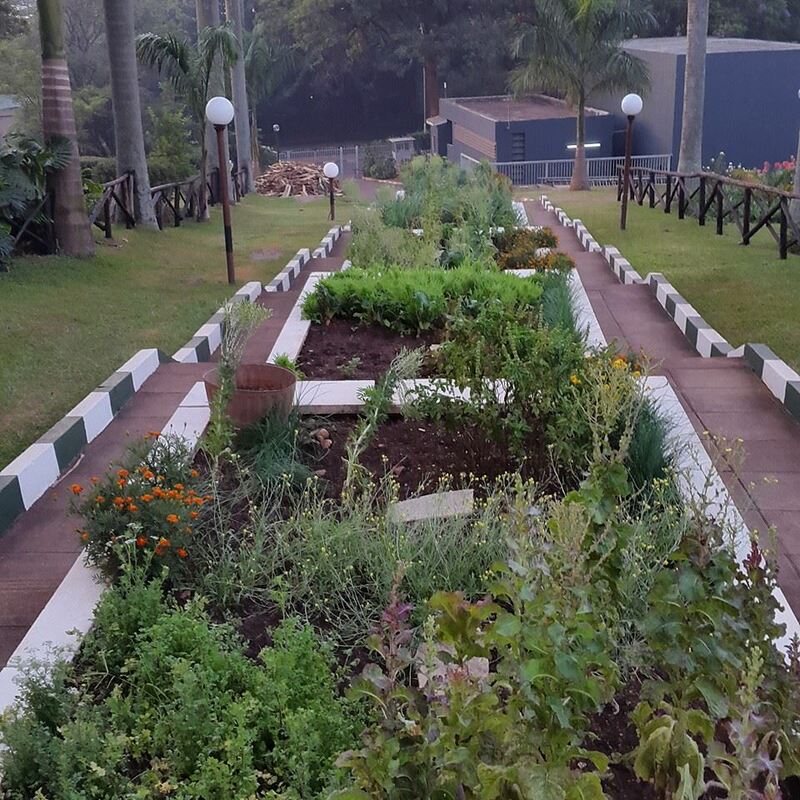 I doubt that the hotel’s entire spice and vegetable supply comes from this very garden but if it did then how revolutionary that would be! You see, in Uganda we can grow almost anything anywhere, but spend a lot of time whining all over this fertile soil. Three weeks ago as I drove through Eastern Uganda in the blazing heat and dust I kept noticing a strain of a plant we call omujaaja (a type of mint) all through Busoga, Butaleja, Mbale, Kapchorwa, Soroti and further. It took me a day to pluck up the courage to throw some leaves into a flask in my hotel and it WAS omujaaja or similar! In Soroti they call it emopim and everyone I asked found it quite unimportant. From the images on the internet and descriptions, this emopim is most probably a variety that is commonly called Catnip, one of six hundred (600) varieties of mint out there. “Aaah! Even the goats don’t like it!” declared one chapI asked on the ground. I was flummoxed, and could not even begin to explain how there was wealth amid all that dust, considering that simple internet searches put 250grammes of Mint Tea at close to US$20! Minutes after his goats and emopim comment, the same fellow lamented to me about how hard his life was, and I couldn’t blame him because obviously nobody was telling him about the value of herbs and spices. Ironically, countries in the harshest climates of the globe grow the bulk of the world’s spices – India, Bangladesh, Turkey and China are top of the list – yet we can do much, much, much better with our soils using little pieces of land. One research paper I checked put the global spice and seasonings market at US$12billion last year and reckons it will grow to US$16.6billion by 2019! And even here, in all the urban centres of Kampala, the price of herbs, spices and vegetables is quite dear…yet a lot of them are STILL imported from other lands. Whining while standing on top of this soil. Seriously, unlike the lamentations put forward to me by some young (they claimed) chaps this week, we don’t need to each own massive tracts of land in order to engage in gainful agriculture. 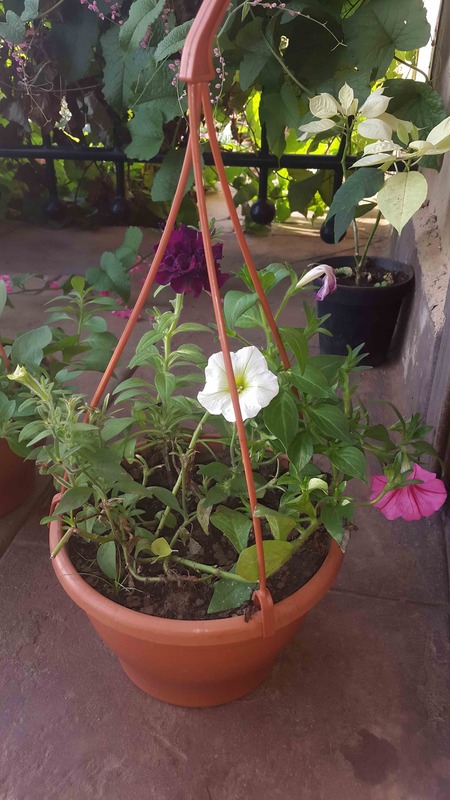 Of course it is always better to go large scale and fully commercial, but even a chap in an apartment could cultivate enough herbs and spices in buckets on his verandah to make a nice little income supplying a couple of restaurants. I’ve started my own experiment at home and strongly believe we won’t be buying coriander after a couple of months. And I will take the savings from that and pile them up to replace another plant…like that, like that as I spice up my life! your name’s on the bottle, your identity isn’t…but what’s inside? I am not going to piss into anyone’s can or bottle of soda, and certainly not on the brilliant marketing campaign that the Coca Cola company is running right now. 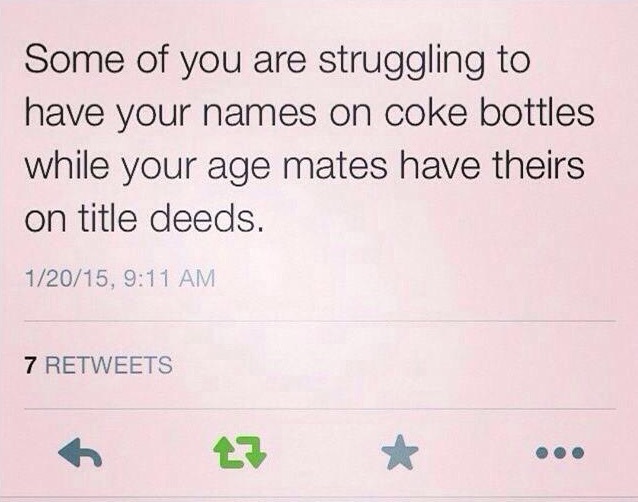 This is the ‘Share a Coke‘ campaign we’re all talking about, in which people are putting their names on cans or bottles of Coca Cola…or, to be accurate, Coca Cola is putting people’s names on cans and bottles. “Eh-eh! So why have you bought this?” she asked, pointing at the bottle. It clicked, I laughed, and then told her to finish her job so I could leave. The campaign is brilliant because it has been successful enough to get people talking about Coke and even I have posted a blog on this. Plus, and more important to their bottom line, people are definitely buying more coca cola because they have their own names on the items. I don’t know who sent the original tweet but it made one stop to think; and to notice how misplaced some of the excitement over this campaign has been. That tweet should be framed and put into a Timeline of Fame. I am now thinking about that lady in the Nakumatt who thought that I had actually put aside time to riffle through the bottles on the shelf, looking for my name on a bottle of soda. Which I would drink down and empty. Then what? How could she look at me and think me so bereft of distractions serious enough to outweigh one involving seeing my given name on a retail product? Nanti: It almost doesn’t make sense, how we are falling over ourselves to do this, which is, again, why I say Coca Cola has done a brilliant job at marketing. 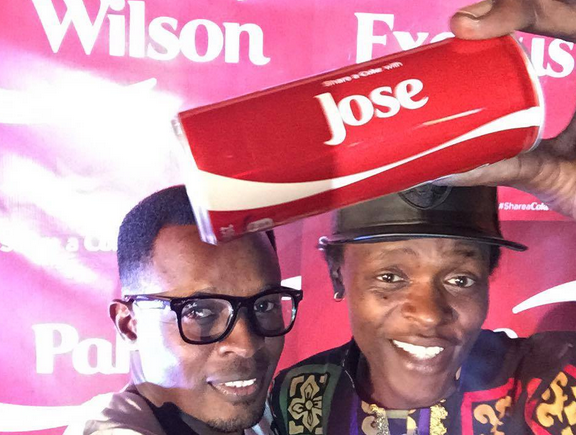 This is another level of neo-colonialism: An African chap struggling to put a Jewish or English name onto an American branded bottle… But at least the Coke is bottled here. And the bottles are made close by…somewhere, I think. By the way, WHERE are these bottles made? Do we import empty bottles and cans and then fill them with the stuff here? Do we have responsibility programmes for the disposal of cans and plastic coca cola bottles? If the campaign had been taken to Minute Maid bottles, those ones that are also owned by the Coca Cola company, and particularly the Mango flavoured juices which are presumably made from mangoes grown strictly in Uganda that therefore enrich ordinary Ugandan farmers in northern and eastern Uganda, would it be much better? 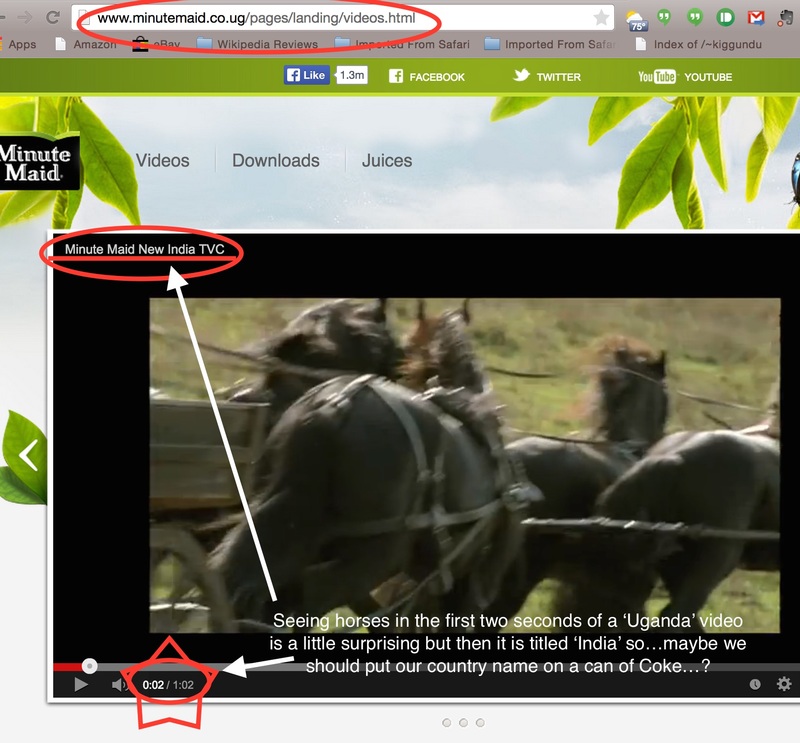 First wait – the Wikipedia site for Minute Maid doesn’t list Uganda (https://en.wikipedia.org/wiki/Minute_Maid) – why? 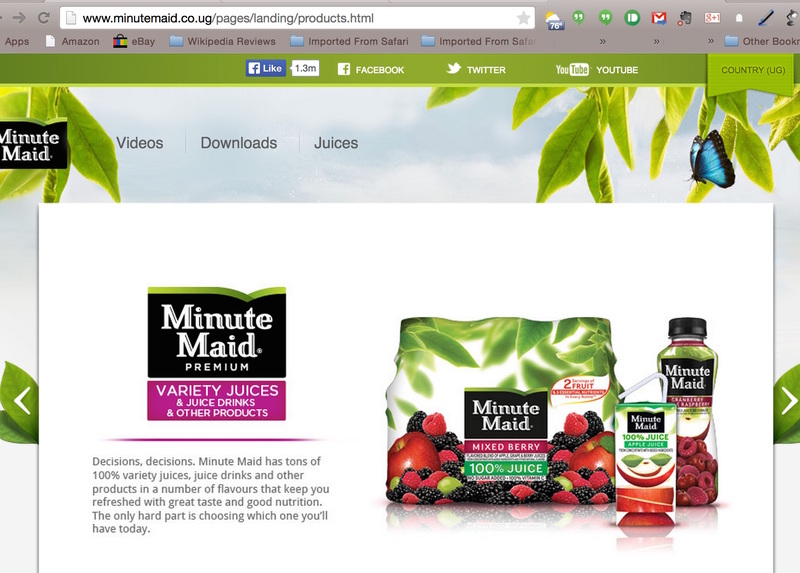 My panic was short lived, thank God, and I eventually found it here: http://www.minutemaid.co.ug/pages/landing/index.html though I was amused at the obvious non-Ugandanness of the brand. Where did I even hear that the mangoes in the Minute Maid Mango drink were grown in Uganda? And their slogan is “Made With Nature”, which would go well with “Gifted By Nature”, but unfortunately we are not in their natural picture. 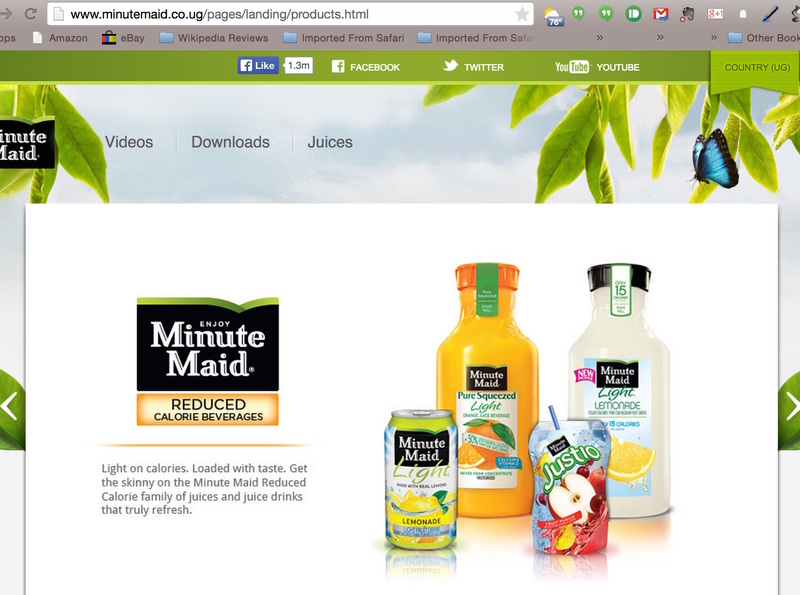 Before we go back to putting ‘our’ names on Coca Cola cans and bottles, I wonder where the hell I got the idea that Minute Maid Mango juice is made out of Ugandan mangoes? Plus many other stories talking about this “sustainability” project that involves the Bill Gates Foundation. There is even a serious study published by ‘CSR Initiative of the Harvard Kennedy School’ titled “PROJECT NURTURE: Partnering for Business Opportunity and Development Impact” (by Beth Jenkins and Lorin Fries in 2012). 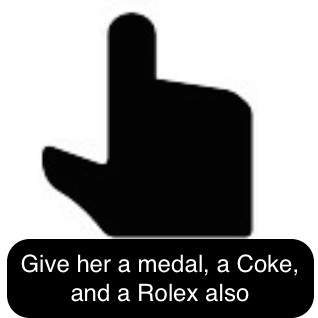 It would be good to establish exactly where within the Coca-Cola system. It would be good to confirm whether any of those 50,000 farmers in Uganda and Kenya are actually producing mangoes or passion fruits for Minute Maid Mango Juice. 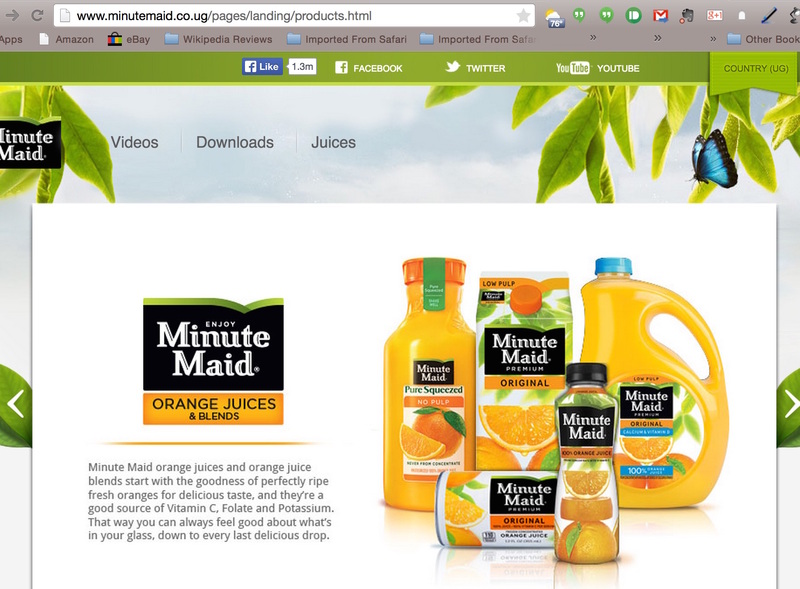 It would be good for someone to tell us where the mango puree used in the Minute Maid Mango Juice in Uganda actually comes from. Which factory produces it (read the study for clues)? How much have farmers earned from this? What has the impact been in their villages, or homes? If these mangoes are being transported in their multitudes, has there been an upsurge in trucks in Eastern Uganda? Have there been new garages set up there for these trucks? What businesses in Eastern Uganda have burgeoned since 2011 as a result of these doubled incomes? Seriously, is Minute Maid produced out of Ugandan mangoes or not, and should we be putting our names on THOSE bottles instead of Coca Cola cans? Let’s not allow investigations of this nature to get in the way of journalists covering crowds of people queuing up to put ‘their’ names on cans of soda. No; let’s not distract them lest they even suggest that this technology of putting names on cans is simply getting a sticker and pasting it onto a can. No; instead, let’s jump onto the wagon of soft drinks but since the 2015 slogan of Coca Cola is “Open to Suggestions”, those who dare could submit a few to the people at The Coca Cola Company. Mine would be: Publish the names of those 17,000 farmers on bottles of their Minute Maid Mango Juice and get some of us to buy them in celebration of their labour. One morning this week three conversations came together to highlight a point that had been tingling at the back of my mind for a week or so. In the first, a prominent Ugandan Pastor kicked off the day by declaring, “We are backward!” on the basis of some whimsical observation that he had followed up with no research on whatsoever. The ensuing conversation quickly became angry, mostly because of the irritation some of us face whenever we meet self-deprecating people volunteering negativity of this sort and casually branding the entire nation this way. The second involved a group of youths that have taken to constant agitation for dispensation from the government just because they are youths. This conversation was as inane as all the ones these groups normally engage in, harping on their so-called support for this politician or that politician and positioning themselves for some financial consideration in return, or simply making noise about anything and everything without critical thought. , whose hero this week was Mubarak Batambuze. You may have heard of Batambuze but ignored his story after a while since he is just a fisherman from Kaliro and therefore not as deserving of our national attention as, say, a politician, a naked entertainer, a philandering harlot or a witchdoctor based in South Africa. But this man’s story has been on my mind for a couple of weeks now, and whereas Kakoma’s blog highlighted for me exactly why Batambuze is so important for all Ugandans, his profile and activities stood out even brighter when considered against the background of the flashy, misguidedly outspoken Pastor and our hordes of rambunctious youths. 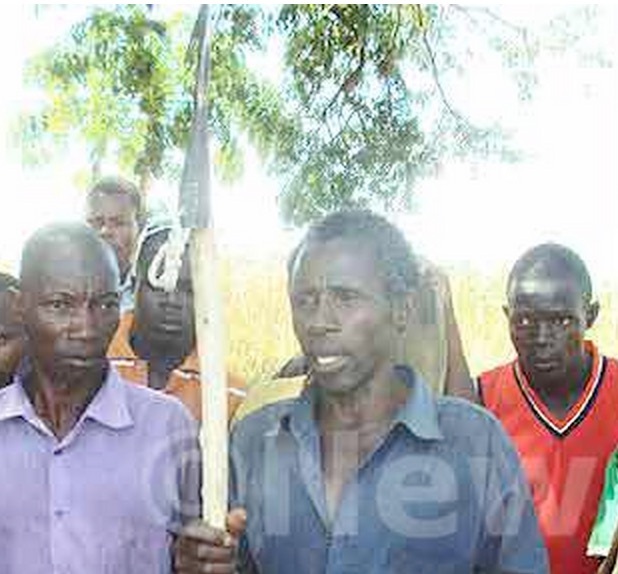 Batambuze, aged 56, hails from Kibuye village, in Nawaikoke sub-county in Kaliro, and came to fame because he went after a massive crocodile that had killed his wife, Demeteriya Nabwire (may her soul rest in eternal peace), who was eight months pregnant. The crocodile reportedly killed and ate her that Sunday morning as she fetched firewood, and residents could only tell because they found her “toes, fingers and a mobile phone” on the scene. The same crocodile is said to have killed and eaten six women and children who were fetching water at the same spot last year. The irony of the poor lady having a mobile phone on her while fetching firewood would confuse a normal economist and make one hesitate to declare her “backward”, but that wasn’t my focus point. Neither was it the fact that so many people kept getting killed by the damn animal while fetching water, which brought to the fore of my mind arguments we have been having on Twitter about how well the National Water & Sewerage Corporation is doing spreading its network around the country. 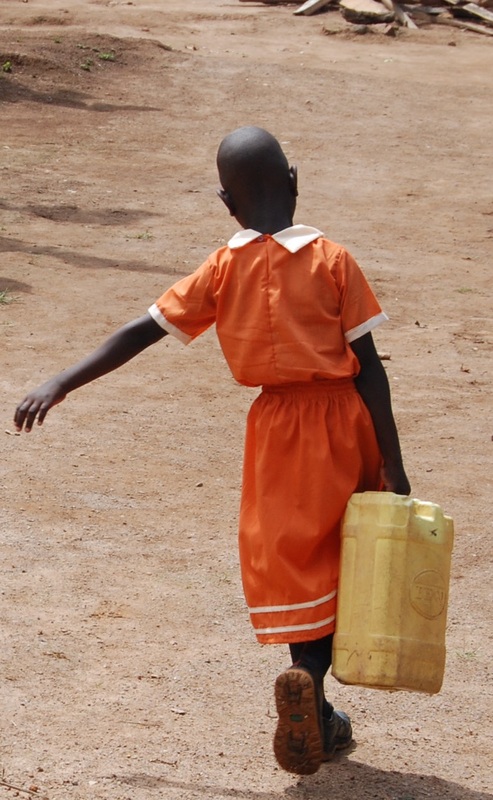 Cost of the water aside, if they had gotten piped water to Kibuye last year, perhaps people like Nabwire could sacrifice some airtime money for clean, crocodile-free water (though she was gathering firewood, not fetching water). I repeat: he WENT TO THE BLACKSMITH AND PAID HIM MONEY SO THAT HE COULD MAKE HIM A VERY SHARP SPEAR! This man must get a medal next year on Independence Day. Now, first stop what you are doing and go measure what 25 feet actually looks like, then imagine the courage that Mubarak Batambuze utilised to address this crocodile. (I did the measurement with my children, using a foot ruler and walking the distance – this is NOT a joke). Then, weigh yourself and imagine how many of you would make up 1,000 kilogrammes. See why he needs a medal? 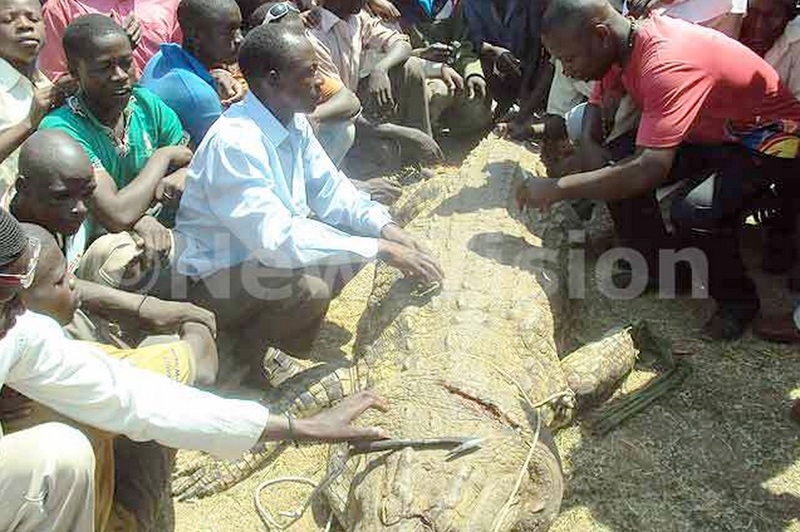 But now, rather than go the way of ’Tusaba gavumenti etuyambe’ to get rid of this over 1,000 kilogramme crocodile, he whipped out his own hard cash and ordered for a spear. This fisherman in Kaliro did not hesitate to spend Ushs20,000 on this. And forget the nonsensical people you and I deal with in so-called corporate Uganda, university graduates and people speaking in TV accents who cannot accomplish a task without “First going” or “First checking” or “First seeing”; Batambuze swung right into action! The man should become a motivational speaker, or a university lecturer, so that we get more Ugandans of his dispensation. After paying for his very sharp spear, THEN he went and killed the monster – singlehandedly. He didn’t hold a fundraising meeting the way we do for weddings, graduation and even baptism parties – he went ALONE. He didn’t even dilly dally by first going for his wife’s lumbe and crying a bit and collecting the mabugo; he went straight into action. And how old is he? 56 years old; not youthful at all yet very useful. All these whippersnappers making noise in demonstrations and political rallies and on Facebook and Twitter and can’t even spell words properly even in vernacular need to step aside for Batambuze! The 56-year old man chose not to lament but solved a problem that had his entire village celebrating, with even his RDC (no need to mention his name) standing on the crocodile to address locals. Better still, his heroic action has been picked up by the media internationally and given such wide coverage that there might be a movie made about him a la ‘Crocodile Batambuze’ – which means that wherever you and I go and say we are Ugandans, people will look at us in awe as Crocodile slayers, rather than “backward” as the despicably self-deprecating would have us called. I have seen public officials refuse to do the simplest of tasks because of lack of “facilitation “, and even so-called corporates in private companies fail to deliver profitable services because of “close of business” and authorization required and all sorts of other stupid excuses. Strictly speaking, Batambuze should have called the Police and the Uganda Wildlife Authority. He should have had the RDC address the matter during the district security committee meetings, and maybe even have written a Letter To The Editor and tweeted about the menace the crocodile presented to the village, criticising the government for doing nothing about this problem. But Batambuze is a hero. By doing what he thought needed to be done for his community, taking matters rightly and justly into his own hands, he showed the world that true Ugandans are strong. We don’t let the environment, the jungle, the beasts, the monsters get the better of us. We fix problems. We face our fears, with preparation, planning and bravery, then tackle them to certain victory. 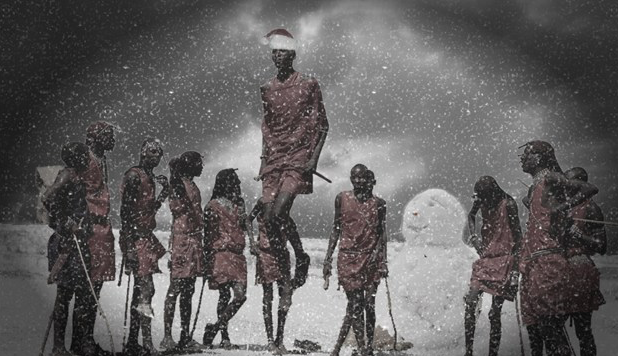 Batambuze is a hero. A true Ugandan hero. I hope to one day get a clear photograph of Batambuze so that I can mount it on my wall with his story, and ensure my children’s children take his story to heart. Seriously, give that man a medal. Tell your children about him: Batambuze, the Ugandan hero. 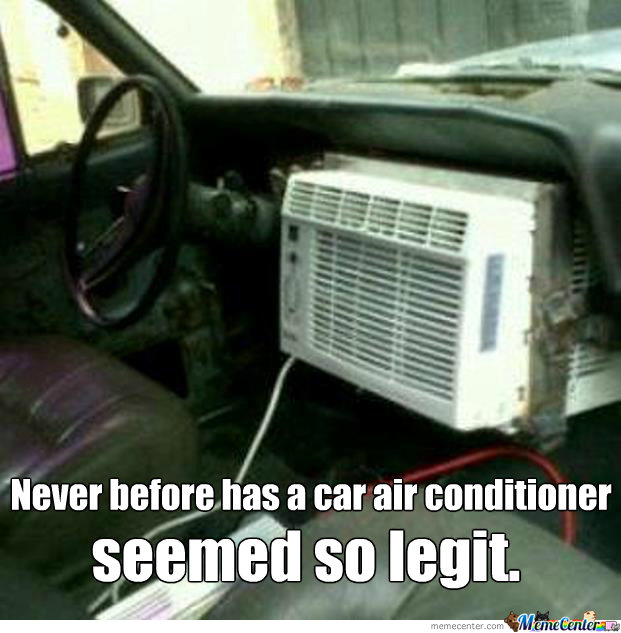 The Hot, Sunny Days Are Here, so what are you and I going to do about them? tropical heat while mindlessly reciting the idea that this is now “winter” time, let’s address simple global warming issues. In October last year NASA experts announced that planet Earth will suffer an unprecedented heat wave this year (they said in Summer, but what do we know about such things? ), and in December they said something else about the Arctic cap melting fast and the earth absorbing more and more heat. For the average individual, the concept of global warming is complex and doesn’t make easy Sunday reading or mealtime conversation, so the best approach is to break it down into simple bits and pieces that we can manage in our homes or at our office desks. To begin with, most of us are going to instal (more) fans in our homes to cope with those night-time temperatures, and some of us will even buy humidifiers and air conditioners. It is unhealthy, in this heat, to hold our breaths for too long but we are doing so as we wait for supermarkets and electronics companies to launch promotions on fans and air conditioning units – surely it’s only a matter of time before they do so. They should have ordered for heavy stocks months ago in anticipation of this time, since we knew about this as far back as October. There is some heated irony in the fact that these purchases will increase our energy consumption and thus have an even worse effect on ‘global warming’ and ‘climate change’. That aside, the effects of this heat in our bedrooms could be warded off by planting some large trees right outside to provide shade and create a natural coolness, and in the long-term contribute positively towards the climate and environment. As the tree seedlings grow, our electricity companies are going to grapple with the increased consumption while looking backwards at the generation companies that might soon declare that water levels at the hydropower dams are dropping and therefore there is less electricity to go round. The water company has already raised a red flag, just this week, announcing that there is a daily shortage of 50million litres of water for city supply alone. That means that you and I (or our maids) should do less laundry during the next three or so months. That can be aided by our wearing much lighter clothes so that the laundry consumes less water; therefore thick jeans, suits and heavy cotton shirts and dresses are going to stay in the wardrobe for quite a while and our workmates and clients should expect to see more t-shirts and light cotton short-sleeve shirts in the boardrooms. And we should not have a shortage of t-shirts at this time, because we must have compiled a good number of them to use in the gym and while jogging, now that the holidays are over and we need to reverse the effects of all that food and lounging about. This increased healthy activity automatically means an increase in water consumption for re-hydration – which is actually necessary, in this heat, even without the exercise. Hopefully the drinking water companies are stepping up their supply of the stuff to meet our biologically increasing demand. Annoyingly, their increase in production means more energy consumption, and so on and so forth. Speaking of energy, solar energy companies should be raking in billions from people who’ve calculated how much benefit they can garner by using solar powered equipment for at least these three months. This is the time to identify technology out there that can charge solar-powered batteries for these three months so that we can use them for the rest of the year even if it’s dark non-stop. The charcoal makers, for instance, are certainly taking advantage of this heat and dry weather to turn trees into sacks of charcoal that they will sell for the rest of the year. In fact, these guys are working so hard that we’ve got to think of the government at this point and ask that they look into their activities a little more closely. Supposing in the enhanced heat of the season their activities result in a forest fire? How ready are we to handle that kind of disaster? Stepping back from the government a little bit, how ready are we to handle any fire in this heat? Are our fire extinguishers serviced and our sand buckets filled up? And moving back to the government again, how many medical staff do we have available at health centres to deal specifically with cases of heat-related emergencies? Our medical personnel should be undergoing special training in how to handle fire-related injuries, for instance, with burn kits and whatnot. It would probably be the work of the National Planning Authority (NPA) to create a schedule based on research done by the Meteorological Department to show which parts of Uganda would be most severely affected in which way during this hot spell – some by way of drought, others suffering fires, and others because of dry air. The NPA would also have coordinated with other scientists to work out what germs might be thriving during this hot season so that the most appropriate antidotes are stocked in the National Drug Authority (NDA). warehouses. I AM not always keen on New Year’s Resolutions because I find they don’t always work for people like me. People like me who felt deprived of something or the other in their childhood, broke free at a certain point and there was nothing, not even good, common sense, that was going to stop us from catching up. We did everything we couldn’t do as children and yet thought was “fun” or “cool”, and we went overboard. Once we found ourselves swimming in the lake of life we floundered, and got deeper and deeper into rivers and sometimes the ocean of all the vices we had suddenly discovered. People like me are also easily distracted, even before you throw in work, family, the wider family, Twitter, Instagram Facebook, the side-job, social work, pals, TV entertainment and downloads…and so on and so forth. So for us to commit to big time life-changes kick-starting from one date and then sticking to them for a whole year is really hard. It doesn’t even work if people like me tend to forget the pledges we make to ourselves, then set calendar reminders and get spouses to nag us constantly as reminder tactics. Life only conspires to remind us of these resolutions some time in December when it dawns on us that we have to make resolutions again for the coming year. So this year I am going at it differently; I am choosing 15 different things to do throughout 2015 that will be easy to implement, easy to measure, and also make changes to my life and the lives of many other people besides. The tactic is quite simple: choose small things that are easy to do, clearly measurable, and that make a big difference not just to self, but to many other people as well. That last bit of the big difference to other people means that it is harder to make a personal, single-minded decision to just drop whatever life-changing action you chose. You can decide to resume drinking, for instance, because dammit the hangover is yours anyway, right? But if you commit to giving an orphanage a certain number of packets of milk every month you can’t just stop doing so because you will be depriving all those little children of a pleasure and benefit that they wouldn’t have had in the first place if you hadn’t started doing it. 1. 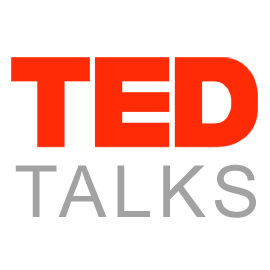 Consult one global expert on a key issue every day – not always by talking to them, but by reading their blogs and articles, watching their TED Talks, reading their books. This is every easy to do and only takes up about five to ten minutes of one’s time every day. Other People Element? Commit to sharing one lesson per day to people who will take you to task for it. 2. Read at least one article every day on exercise and fitness – See how idea number one works so easily? I thought this one up by way of consulting a global expert in a TED Talk. Meanwhile, it’s easier to read about exercise and fitness than to start out actually going to the gym or hitting the road with running shoes, and reading will make me more likely to exercise…eventually. 3. Watch a comedy or read something humorous for thirty minutes every day – which will, without a doubt, make one more pleasant company to be around. Other People Element? The people that you interact with will definitely be the winners here. 4. Thank an individual every day for something they have done – which may sound mushy, but if you do this you will probably close the year with 365 more people with a positive disposition towards you than before. Make sure the persons you than are not necessarily friends or relatives and this works even more wonders (and, of course, it can’t be the same person every day). If I do this I will maintain maintain a list of all the people I thank and the things I am thankful to them for. Other People Element? That individual (or those individuals) that you thank will be the winners, for sure! 5. Water my plants at least once every single day without fail, provided I am at home – which has the additional pull of making you go home every day…not that I don’t but you know what I mean. Other People Element? Your housemates (read family if you live with your family). 6. Plant 50 trees a month in both Wakiso and Hoima – or wherever you come from and wherever you live, so that you hit this mark one way or another. The number could be one, five, ten, fifty or a thousand – just choose one that you will make happen. Other People Element? Of course, the people that you hire or employ to manage those trees. 7. Buy at least ten (10) goats between now and December 2015 – another simple resolution and one that only requires you to put aside the equivalent of one goat’s purchase cost every month starting January. And to put aside land for the goats to graze. And the salary of a goatherd. And…well, this could easily become more and more complicated, but after achieving the goal, if you mix up the genders appropriately, then you can sit back and watch the herd growing month on month. 8. Donate 20 packets of milk (or something) to an orphanage or children’s home every month – very easy to do, especially if the orphanage or children’s home is along your daily route home or to work. A packet of milk is, about Ushs3,000 at most so it’s like stopping for a little fuel every single day. Alternatively, you could pay a milk supply place near the orphanage/home and make arrangements for people from that place to collect the milk when they want it. You could replace milk with cereal or a tray of eggs or anything that you’d want your own children to have on a regular without thinking about it, and change the lives of some vulnerable, disadvantaged little ones who have never thought their prayers would be answered in this way. Other People Element? Too obvious to go into now. 9. Bless a child every day – not like in 8. above; I mean just say a prayer over a child every single day. It could be your child, or my child, or a child you’ve seen on the news. By saying a prayer or whispering to that little one the words, “God bless you”, you are being an angel for real. And all you have to do is to say those three words. The positive wishes and energy alone should suffice to make a difference somewhere in the atmosphere. Don’t go to their beds if they’re not your real children, just say the prayer and go to sleep. Other People Element? All those little children you bless. Other People Element? This one is tough, but if you’re married then it’s obvious that your significant other should be the main beneficiary. 11. Identify my desired circle of influence and take position – adopted from this simple and very sensible article shared with me by one of my brothers just this week. If I want to be a good piano player, I’ve got to start hanging out with good piano players; if I want to be a good gardener, I’ve got to start hanging out with good gardeners; likewise for anything else I hope to achieve. Some of what they have got must rub off on me. Other People Element? All the people that associate with you in whatever way are the beneficiaries here, also because you become the type of person that THEY also eventually latch on to. 12. Exercise the mind – and this can be done in a variety of ways; do a crossword puzzle, or Sudoku, or a quick quiz, or try to recall the minute details of a long ago event such as that Bukuku the gatekeeper story…something that makes the mind strain a little bit. You will be grateful when you’re 75 and still able to recall details that the 15 year olds running this country then will find amazing – like the events of 1986. Other People Element? Believe me, the more you sharpen your mind the better company you become for more and more people, which you don’t notice until it just hits you. And when you one day show too much of an interest in stuff like Zaro (is that how she spells it?) they will remind you. 13. Focus on creating one long-term, special gift for someone later this year – and this doesn’t need to go to the most special person in your life, but to someone who will realise what effort you put into that gift and will be all the more touched by it. Plant a small tree, for instance, or a pot of tomatoes or spices or herbs; or stock up a First Aid box over the next six months with a wide range of medicines, salves, plasters and bandages. – even spending Ushs3,000 a month could stock up a very well populated first aid box that could save lives. Other People Element? You’re joking, right? 14. ‘Invest’ something small into the village every month – this matters very greatly especially if you live in the city, and is linked closely to 6, 7 and probably 8 above. The amounts that city dwellers in Uganda spend on ordinary stuff every day could create miracles in most upcountry settings. That lunch time buffet of Ushs15,000 could drop Orange or Mango seedlings into ten homesteads in your village and make you appear to be an aspiring Member of Parliament (MP), yet you’d be changing the nutritional situations of some people as well as providing them a kind of income arrangement. Of course, you’ve got to appropriate your intervention to your particular village and what goes on there, so use your brain (see number 12 above). In order not to attract the wrath of your MP, this being a campaign year, you could use them and make this part of your campaign contribution to them, and maybe even rally other city-dwelling villagemates to do the same so that many of you make a massive difference overall, together. Other People Element? All the people who take that investment seriously will certainly stand to benefit, as will the MP who headlines your initiative. 15. Building on 14. above, what about mobilising your family – right away so that each of you in the family, for instance, puts aside just Ushs10,000 per month beginning January, aiming at a big Christmas gift for your local health centre or school or something. Think about all the people you spent Christmas time with in the village and consider how much you’d collect if each of you put aside just Ushs10,000 a month from now to December, and then choose something worth that amount of money as your Family Christmas Gift. Other People Element? Again, you’re joking asking this, right? Note: I am NOT doing all the above…or not saying that I am going to do it all. These are guides to stuff YOU could do quite simply and still make a difference to your life as well as the lives of other people. It’s almost a resolution itself to drop the habit of making those boring, normal, selfish, non-functional New Year’s Resolutions that nobody ever really keeps, or that few people care about anyway, for ones that are simple, measurable, and have an impact on other people rather than ourselves.